Here, BBC Test Match Special pundits Ebony Rainford-Brent, Jonathan Agnew and Vic Marks give their verdict on England's defeat. "I don't think England were 100% on the mark today, the bowlers didn't quite bowl to their plans and the batters weren't great at rotating the strike. "The bowling was the biggest problem. Charlotte Edwards is normally able to set good fields, but the bowlers were not able to bowl to their plans. The batters only really hit boundaries, there was a lot of dot balls in between. England will want to analyse that because the World Cup is coming up next year. "It's great for women's cricket to get an exciting final to get to the last ball, so well done to the lower order for keeping England in it. "I think Charlotte Edwards has a couple of years as captain left in her. I'm not sure how her body will hold up, she's had a few problems with her knees but her class is still evident. "My gut feeling is that she will get through the World Cup next year, then she may spend a year or two blooding the next captain, whoever that may be, but I don't think she'll make it through to the World Cup after that in 2017." "I think Australia seized on the opportunity of batting first. England had won all their games batting second but in a final you put pressure on yourselves if you decide to chase. "Australia got off to such a good start. Meg Lanning, Alyssa Heally and Jess Cameron got them to a target which was always going to take some chasing. 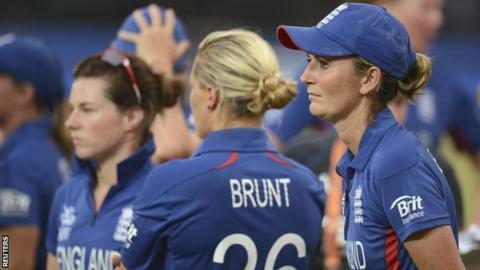 "A lot of pressure was put on England's top players, Edwards and Sarah Taylor. Although they showed briefly what good players they are, they couldn't produce a major innings. "There was some brave batting by England at the end, but they couldn't manage a major innings. Australia always looked in charge from about 10 overs in. England have had the burden of being favourites, but on the day they were outplayed by a sharper Australian side." "England can't quibble with having been beaten because they were not at the best. In the field and with the ball, they looked tense. "On the day, you have to say that it was Australia's game, and fairly so. "We were all a bit surprised that England went with their tried and trusted method of fielding, rather than batting first. "England are a pretty honest bunch, they will go away and analyse how they performed in the field and look at those opening overs with the bat. "The questions always seem to be about the need and desire to put on a really good show, but we got it there and hopefully that is a shot in the arm for women's cricket."